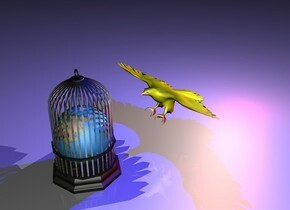 The golden cage is on the wooden table. The small lamp is inside the cage. The ground is the blue water. The sky is the sand. 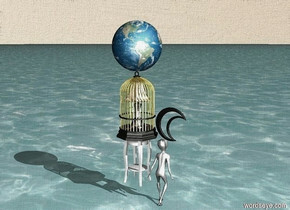 The small Moon is near the cage. The small Earth is on the cage. The light is inside the lamp. The Moon is black. The small alien is near the table. The Alien is under the Moon. 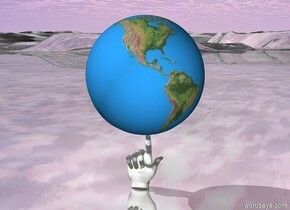 The world is in the huge hand. the hand is upside down. the hand is leaning 90 degrees to the right. 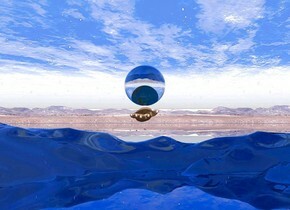 there is a huge clear sphere in the world. the hand is 10 meters above the ground. the ground is clear. there is a bright light on the sphere. there is a bright light under the sphere. it is noon. a 20 feet tall head is -5 feet above a first large clear white barrel.a first clear white 10 feet tall lettuce is -6 feet left of the barrel.a first clear white 10 feet tall cauliflower is behind the lettuce.a first clear white 10 feet tall cabbage is -5 feet right of the barrel.a second clear white 10 feet tall cauliflower is -4 feet right of the cabbage.a second clear white 10 feet tall lettuce is -5 feet in front of the barrel.a second clear white 10 feet tall cabbage is -3 feet behind the second cauliflower.the barrel is [crystal].the ground is shiny[crystal].a red light is 2 inches above the barrel.a yellow light is above the barrel.the yellow light is 12 inches in front of the red light.the ground is sea green.the sun is old gold.a blue light is beneath the brain.the ground is 220 feet tall. A second [crystal] barrel is in front and 6 feet to the left of the barrel. It is above the first barrel. It is leaning 50 degrees to the left. A third [crystal] barrel is 1 foot above and to the left of the second barrel. It is leaning 30 degrees to the right. A fourth [crystal] barrel is 16 feet to the right of the third barrel. It is leaning 20 degrees to the left. The large sign is in front of the second barrel. The gold tree is 1 foot to the left of the second barrel. It is 30 feet tall and 1 foot wide. It is 1 foot deep. It is on the ground. The cat is in the bathtub on the water. There is a large earth to the left of the bathtub. 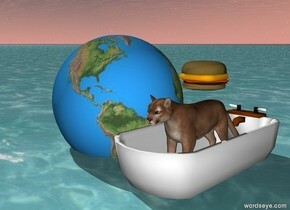 There is a large hamburger above the cat. the ground is black. the dodo is facing backwards. the camera light is black. it is night. The book is 1 foot behind the dodo. it is leaning 30 degrees to the back. 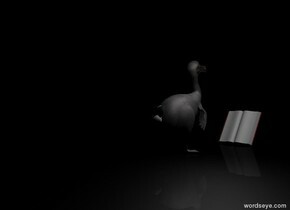 a grey light is above and to the right of the dodo. It is dawn. the big shiny earth is 5 feet above the ground. there is a man behind the earth. There are 5 gold coins under the earth. The 5 big money is 2 inch above the earth. there is gold crown on the man. 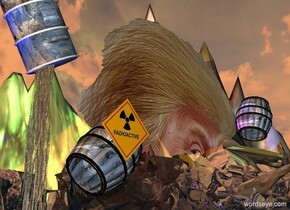 There is man on the left of the earth facing the man. . There is man on the right of the earth .there is moon sky. there is flame on the earth. The ground is shiny wood. there is drill in front of the earth. " 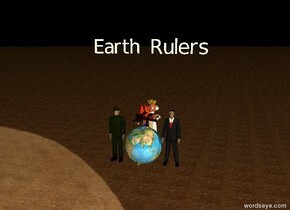 Earth Rulers" 5 feet above the flame. The water rhino. the sky is bright silver. the ground is silver. 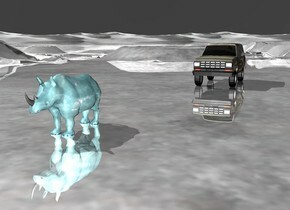 There is a car on the right of the rhino. the car is 30 feet behind the rhino. The car is camouflage. The earth is in the air. ground is silver. camera light is dim. 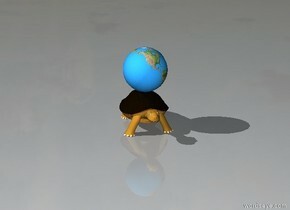 the earth is one inch above the very big turtle. 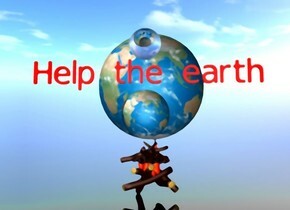 The red "Help the earth" is on top of the earth. Fire is under the earth. 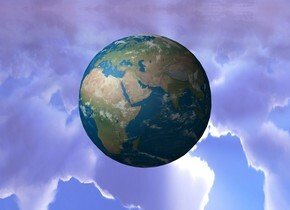 There is a 10 foot wide 2nd earth 5 feet behind the earth. There is a large fire under the 2nd earth. 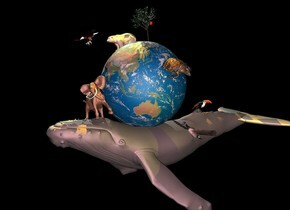 There is a big clear sphere on top of the "Help the earth". The ground is clear. There is a green light above the earth.